Phyllis Johnson peacefully passed away with her family by her side on January 13, 2017. Phyllis was born March 7, 1935 in Peace River Alberta. As a child, Phyllis moved to Summerland, British Columbia. In later years she resided in Merritt and the Barriere area. Phyllis found great pleasure giving kindness to all. She enjoyed cooking and baking in various restaurants throughout the area. Phyllis will always be remembered for her pies and cinnamon buns. Her family was especially important to her. 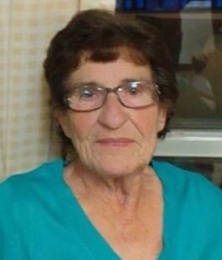 Phyllis is survived by her son, Brian (Terry) of Barriere; grandchildren Gord (Christy), Jennifer (Gary) of Kamloops; great grandchildren Hannah, Derian, Elijah, Rhese, Michael, Briea and Gabriel; sisters Louise (George), Sharon; brother Ross; brother-in-law Raymond Johnson; and numerous nieces and nephews. Frank and Sue Gunderson and all the Skeldon family, as well as many dear friends. Private family arrangements have been made. Mom will be laid to rest with Dad Cully and infant son Bobby in Penticton, BC. In lieu of flowers, please donate to Kamloops Hospice House, 72 Whiteshield Cres. S, Kamloops, BC, V2E 2S9. My thoughts are with you all. Phyllis was a very kind hearted lady. I can still see the look on Glen’s face when she brought his meal out at her restaurant. He would always say she was the best cook in town. The day Phyllis met Frank Skeldon, she became family.We had alot of good times together. We are going to miss you alot. Rest In Peace Aunt Phyllis. Our condolences to your family. Phyl married our uncle Frank and soon became our aunt. She was a wonderful person who cared deeply. Rest in peace. Thoughts are with all of you. The family, on the loss of your Mom/ Nan. The world lost a great person when Phyllis left us. I worked under her guidance when she operated the McLure restaurant where she created a standard for other restaurant cooks and chefs to try to catch up to. Some tried, but few have succeeded. She was a star in the kitchen and every plate or dish of food she served was loaded with love and pride. I still treasure one of her recipes that I call “Phyllis’s Prize Butter Tarts”. Although the recipe comes from her, I can never seem to get that same finish to them that she did. Phyllis will be missed, but fondly remembered by my entire family.